1 3/4" Turned Legs with 1" stretcher and Captains Back with Dark Cherry Oak Finish. Seat heights are available in 24 1/2", 30 1/2" and 36 1/2". This is a discontinued model. The Captains Back turned leg dark cherry finish oak bar stool is a commercial grade bar stool with a seat height of 24", 30" and 36". The turned legs are 1 3/4" diameter with 1" stretchers. The stool will look amazing and classic wherever you might put it. Made with turned legs and a 360 degree swivel you'll find it's versatility useful at the counter or at a home bar. Seat dimensions are 19" Wide with a 18 1/2" Seat Depth. Back Height is 13 1/2" from seat to top of the back. The Captains Back weights between 25-30lbs depending on the seat height. The Holland Barrel dark cherry oak finish swivel stool with captains back is made for comfort. 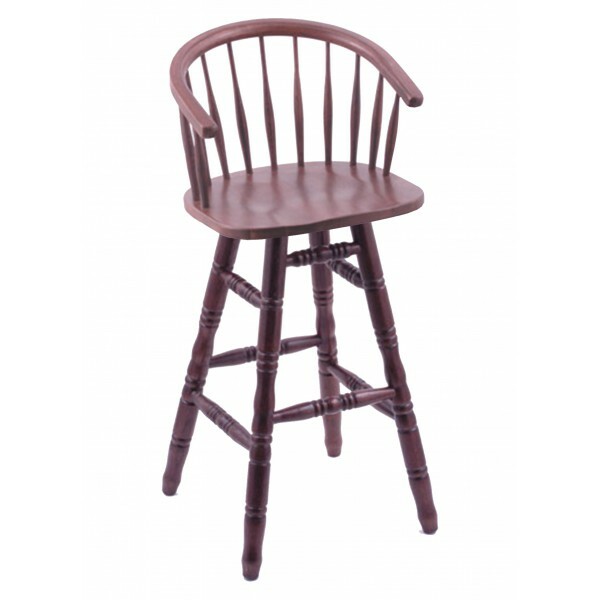 Turned legs offer this bar stool a classic look and style that your sure to love.